Asteroid mining and space law: Who gets to profit from outer space platinum? Is It Legal to Mine Asteroids? There’s gold in them thar skies, or at least some platinum and a substantial amount of water, according to hopeful space prospectors. 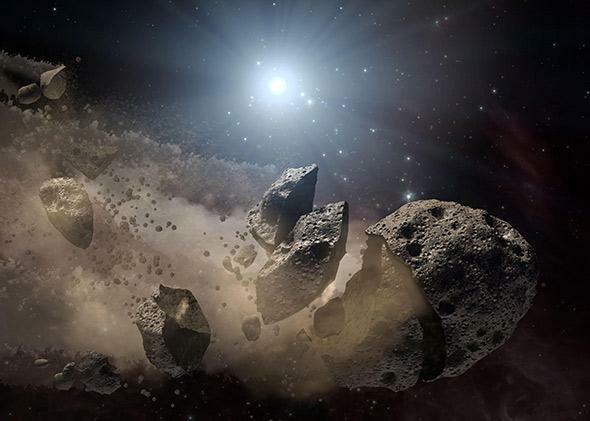 Over the past several years, a few companies have announced plans to mine asteroids. If successful, they could reinvigorate earthbound industries with infusions of rare earth minerals. They could also catalyze a new phase of space exploration by creating orbiting caches of material to build spacecraft as well as water, which could fuel them. Even if these efforts fail, they could lead to new technologies and lower the cost of a rocket ride to orbit. Of course, there are technical challenges. A vast, radiation-filled vacuum separates the space entrepreneurs from the space rocks of their ambitions, and any actual mining is many years away and might fail. But the current crop of space entrepreneurs are far more credible than the cranks of yesteryear, people who might have sold plots of lunar real estate in the days before the Apollo missions. There are tech giants with proven track records, such as X Prize Founder Peter Diamandis, whose Planetary Resources boasts James Cameron as well as Google’s Larry Page and Eric Schmidt as investors. There is a real possibility that asteroid mining could become a reality within our lifetimes. That possibility raises some very interesting questions. First and foremost, it’s not entirely clear whether mining and selling asteroid stuff is even legal, which could really hamper the whole enterprise. Space is really big, and doing stuff there is really expensive. Even billionaires need additional investors for that sort of thing, and if you’re investing in a platinum mine in the sky, you want to know the miners actually have the rights to that platinum. The nascent asteroid mining industry is pushing the United States to pass legislation clarifying the matter since the United States has obligations to regulate its country’s private space activities under international law. If these mining ventures are successful, the world could see billions of dollars flowing down from space to American companies. Is there a system for dealing with any conflicts that asteroid mining will likely arouse? The historical record certainly suggests the possibility of bitter, even violent disputes. If emerging space technologies can be thought of as melting Arctic ice, it might be time to start discussing some basic rules before everything thaws. This is what worries Gabrynowicz. Current efforts to clarify the legal status of asteroid-mined resources, if approached the wrong way, she says, could guarantee Arctic-like international disputes over future space activities. The reverse is also a concern: Disagreements over space could influence disputes on Earth. It might be fun to imagine Battlestar Galactica–type conflicts over resources in space, but why spend millions on space weapons when you can hurt your competitor at home and on the cheap? On Sept. 10, the House Science, Space, and Technology Committee held a hearing on the Asteroid Act, a refreshingly short and readable five-page bill that would recognize the ownership by companies of resources they have extracted from asteroids and would also prohibit companies from interfering with the operations of competitors. Planetary Resources sent a letter to the committee in support of the bill. It’s not entirely clear whether mining and selling asteroid stuff is even legal. Above, an illustration of a disintegrating asteroid. Instead of giving asteroid mining a unilateral thumbs up at home, Gabrynowicz would begin building a new layer of international agreements, “You start with three to four countries and begin to reach some sort of agreement on what would happen to the extracted resources,” Gabrynowicz says. It’s a process that might take years, but that’s all the more reason to start now, before any real wealth or resources are actually being hauled through space. Others in the space law community disagree with Gabrynowicz. Brian Weeden is a technical adviser at the Secure World Foundation, a think tank focusing on strategies for peaceful uses of space. He doesn’t expect the sort of conflicts we see over resources on Earth to take place over resources in space, partly because there are vastly larger quantities of such valuables in asteroids than have ever been mined from our planet. He also believes that the Outer Space Treaty is already sufficient legal justification for asteroid mining and that waiting for an international consensus could drag on interminably. Weeden also points out that there is plenty of work to be done domestically before any actual space mining can occur. The United States has an obligation under international law to regulate the actions of commercial space companies, but no agency currently has that authority. The Federal Aviation Administration issues launch licenses and re-entry licenses, but there is no agency responsible for anything that happens in orbit or beyond. But both Gabrynowicz and Weeden seem to be thinking of international law in a fashion that is inherently negative, seeing the need for agreement as something necessary only to mitigate problems. Space law could be viewed as a positive. An opportunity, even. If U.S. policy toward space has the power to affect geopolitics on the ground, why not use that fact to our advantage? If the very discussion of asteroid mining has the power to influence, say, Russia’s behavior in the Arctic for the worse, couldn’t it also be used as influence for the better? And what about other countries with whom the United States has had communication breakdowns as of late? When a conversation turns dull or repetitious, change the topic to outer space. In the early 1990s, the Clinton administration used the International Space Station to keep the nuclear weapons of the former Soviet Union from falling into the wrong hands. In the chaos following the collapse of the USSR, the administration brought the Russians into the space station project because, Gabrynowicz said, “The people that were in charge of the nuclear materials and the rocketry were the rocket forces. Those were the same people that would have to make the decision on the space station,” and the strategy was to open a bona fide line of communication with the people in control of the bombs. It was a gamble, and none of the other ISS partners initially wanted the Russians involved, but it worked. Perhaps similar lines of communication could be opened with states that are nuclear hopefuls. Might a change in topic with Iran provide an opportunity to talk about their nuclear program, or at least give us more insight as to the peaceful or offense plans for their rockets? Or, to take an entirely different tack, maybe we could kick off a new, three-way space race between the United States, China, and Russia, one where we benefit from agreed upon codes of conduct as well as the driving force of competition. We might also direct focus away from the Arctic and the South China Sea and onto those near Earth asteroids. The political opportunities that could come from discussions with other nations about asteroid mining might be of more immediate value than anything the space entrepreneurs can do. It could be years, decades even before the platinum really starts flowing, if it ever happens. 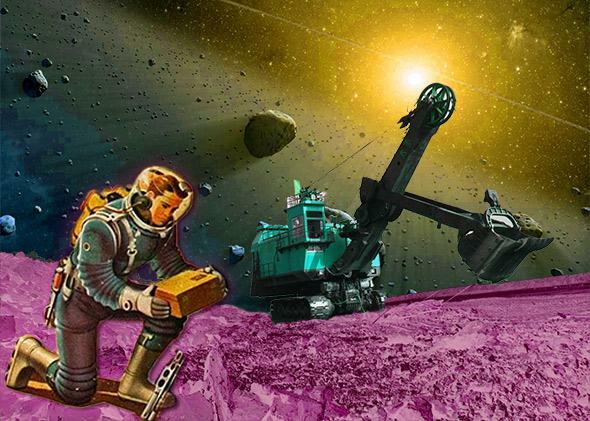 Political alliances forged over a discussion of asteroid mining can yield benefits today—benefits that could well persist even if the dreams of the miners never come to fruition.